To stop forest conversion into other types of land use by 2030. To improve the productivity for some land use categories « shrubs, grasslands » and « lands cultivated » declining, that 2.5 million hectares. To improve carbon stocks on 800,000 ha to reach minimum 1% of organic matter (input of 5 tons of organic matter per hectare every 2 years). Recovery of 300,000 hectares of bare land out of 600, 000 hectares. The government shall now propose projects and programmes enabling to reach these targets. From ReSaD viewpoint, under the design of these projects, it will be indispensable to involve civil society organizations and support their competences in SLM, and their knowledge of territories. It is also necessary to record their actions – already conducted at the territorial level and which contribute to reaching national objectives. 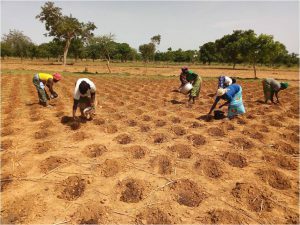 Thus, ReSaD wishes to present the initiative promoted by the Association for Environment Protection and Rural Development (APEDR), which is member of SPONG/ReSaD in Burkina Faso. 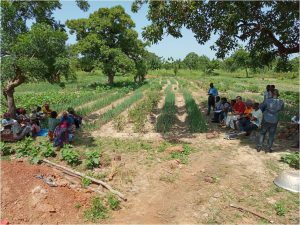 APEDR supports women’s associations in Yako communes to recover lands abandoned due to their important degradation, and enhance biological vegetables production. Under PAFAO project, in partnership with SOLIDAGRO, APEDR trained more than 200 women on agro-ecological production techniques. The plantation of living hedges composed of leguminous plants, the layout of plots in “zaï”, and the association of market gardening under moringa plants enabled recovering degradated soils by limiting the erosion. Women also learned how to make organic manure and biological treatment products. Support to women continued with the access to market, one initial contact was made with the biological certification organization CNABIO. While waiting for the certification of productions, market niches are targeted for the sale of first products: orphanages and restaurants at Yako. Some part of moringa leaves is marketed in Ouagadougou, and France. Finally, APEDR intervention integrated one nutrition component with orange-flesh sweet potato, very nutritive for children and women’s training on nutritional aspects of meals based on moringa and baobab leaves. One challenge remains however, that of securing plots cultivated by women’s associations, necessary to guarantee this project sustainability. 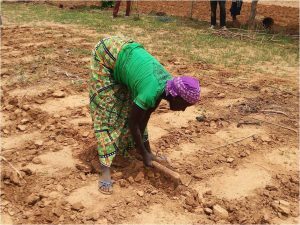 Thus, biological production of vegetables enables these women’s associations to market them with value added, it enables also to improve the nutritional health status of households, while restoring the fertility of soils by using organic manure. Agro-ecology constitutes in this case full answer to all those challenges and contributes to the implementation of food sovereignty, by proposing new innovative and adapted production techniques for a resilient agriculture. The starting intervention on degradated land restoration – in line with a more global approach for supporting women’s associations – enables obtaining results in terms of economic development and nutritional security improvement. This project, while enabling to restore 6 hectares of degradated lands and by proposing to manage them sustainably, thus contributes to achieving Neutrality objectives in terms of Land Degradation (NDT) in Yako commune.